Carrots are one of the most common vegetables in home gardens. These tasty root crops come in a variety of sizes and grow in most average soils. Aeroponics is the science of growing plants without soil. Unlike hydroponics, aeroponics works without submerging the roots in a nutrient solution. A system that supplies periodic sprays of nutrients serves to feed and water the roots in aeroponic gardens. Growing carrots in an aeroponic garden eliminates the need for weeding and pest treatments. Set up your aeroponic grow kit in a sunny location. Follow the instructions included with the kit to connect the various kit components, such as the aeroponic chamber, hydro-atomizer jets, water supply line and drain line. Spread the special mesh holders over the insides of the small growing chambers. This mesh fabric helps hold the small carrot seeds in place while they germinate and begin to grow. Place two or three seeds in each growing chamber. Place the growing chambers into the slots or indentations within the support structure. Cover the top of the aeroponic garden with the vapor shield. This clear cover allows heat and light transference, while keeping the small seeds moist and warm. Fill the nutrient supply chamber with the recommended nutrient solution, according to manufacturer’s instructions. Open the valves to allow water to enter the aeroponic chamber. Set the hydro controller to the recommended setting for carrots and other root vegetables. This will ensure an even and continuous supply of fine vapor mist that keeps the lower chamber environment moist and humid. Check your carrot seeds every day. As soon as the seedlings reach the top of the growing chamber rim, pinch out all but the strongest seedling in every chamber. Allow these sturdy seedlings to grow to maturity. Examine the roots on your carrots near the time of maturity. This length of time may vary, depending on the type of carrots you plant. Check the seed packet label for approximate maturation dates. 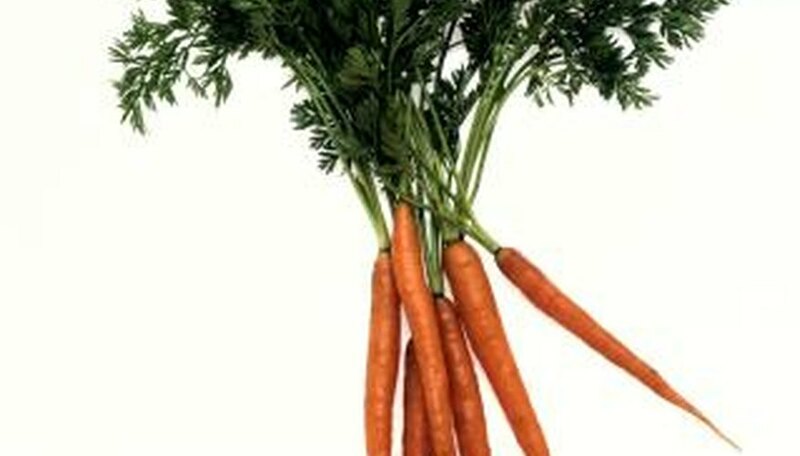 View the developing carrot roots by lifting the tray that contains the growing chambers from the aeroponic chamber. Harvest the carrots as soon as they reach maturity by cutting the exposed roots from the bottoms of the growing chambers. Sanitize and reuse the growing chambers for new seedlings. Plant a few carrot seeds every week in empty grow chambers to create a long harvest season. Follow the cleaning and care instructions provided with your aeroponic garden kit. The moist environment in the humid chambers increases the risk of mold and mildew growth, making it important to keep the garden kit clean and sanitized.